Home TV Shows Your crooked business needs representation? BETTER CALL SAUL returns this Feb! Your crooked business needs representation? 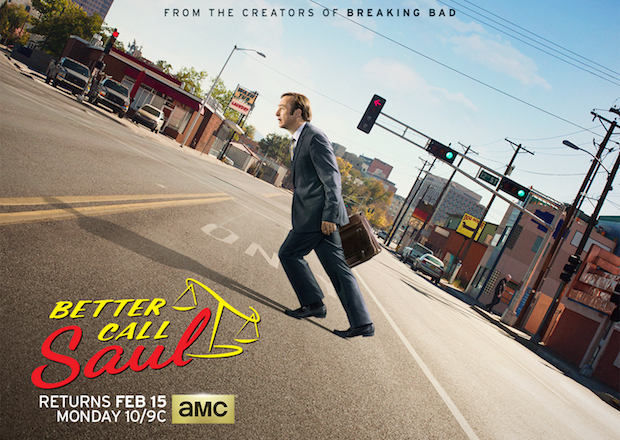 BETTER CALL SAUL returns this Feb! Better Call Saul is an American television drama spin-off of the hit series Breaking Bad. The show follows the story of small-time attorney James Morgan “Jimmy” McGill, six years before his appearance on Breaking Bad as Saul Goodman. Now, the Second Season is going live this February! For those of you who didn’t know, Breaking Bad’s Walter White was a victim of circumstance as cancer and poverty propelled him to convert himself into a drug kingpin in the hopes of providing security and a better future for his family before time runs out. James Mcgill, on the other hand, is a guy trying to do right as a way of making up for his past transgressions despite his many flaws and the lack of confidence from people around him. Even though we all know how he ends up, it’s really interesting to see how he BECAME Saul Goodman. It’s almost feels like tackling a half built puzzle where a lot of the middle pieces are still missing. Last season, Jimmy was hit with a huge betrayal and his morale conflicts would seem to have come to a conclusion. Season 2 continues with that as James M. Mcgill continues his solo career to make a bigger and better name for himself. Maybe this upcoming season, we’ll see Mcgill finally take on the persona of Saul Goodman. Will it happen? We can all find out together for ourselves! The second season premieres on February 15, 2016. Next articleFresh from Nurnberg ToyFair: New Warhammer 40k build sets and Blood Bowl Figures Announced!